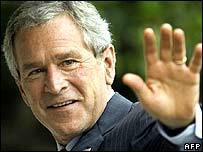 Mr Bush said the fund would help the Cuban people in their "transition from repressive control to freedom". The Cuban government said the plan was an act of aggression, violating Cuba's sovereignty and international law. 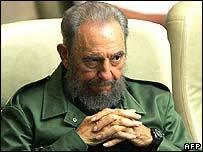 The president of Cuba's National Assembly, Ricardo Alarcon, said the world should be outraged by the actions of the US. "They will not destroy the nation. They will not succeed in doing that. But they will cause harm and deprivation and suffering of individuals," he said. The US announcement comes as President Castro, in power since 1959, prepares to celebrate his birthday in August and amid moves by the Cuban government to give a higher profile to his designated successor, his 75-year-old brother Raul Castro. In a statement, President Bush said he had approved a "compact" with the Cuban people which outlined how the US would support them "as they transition from the repressive control of the Castro regime to freedom and a genuine democracy". "The report demonstrates that we are actively working for change in Cuba, not simply waiting for change," Mr Bush said. The report, drawn up by the US Commission for Assistance to a Free Cuba, also includes other measures such as enforcing sanctions already in place against the communist regime and "providing uncensored information" for Cubans who want change. The commission's members include US Secretary of State Condoleezza Rice and Commerce Secretary Carlos Gutierrez. Ms Rice said the funding and report's recommendations aimed to help "Cuba's brave opposition leaders and to encourage those Cubans still silent out of fear but free in their hearts and minds to dream of a better future". However, dissidents in Havana voiced concern that the new funding could serve as a pretext for the Cuban authorities to step up the pressure on them. "I really appreciate the solidarity of the United States government and people, but I think that this report is counterproductive," dissident journalist Oscar Espinosa Chepe told foreign news agencies. "I believe Cubans have to be the ones who solve our problems and any interference serves to complicate the situation." Since the fall of the US-backed dictatorship of Fulgencio Batista in 1959, Cuba has been a one-party state led by Mr Castro. Since 1961, the US has maintained a strict economic embargo against Cuba.